Increasing ground clearance on any off-roading, trail riding, or overlanding vehicle is almost always necessary. Teraflex's 2.5" Performance Spacer Lift Kit that's made specifically for 2-door Sport, Sahara, and Rubicon models will provide that extra height with the least amount of modifications. This is also a great way to maintain an acceptable ride height for any weight that's added if you decide to put any heavier aftermarket accessories on your Jeep like bumpers, roof racks, larger spare tire, or winches without breaking the bank. Increased Ride Height: provides a more aggressive stance and more importantly, higher clearance for off-roading and trail riding. Maintain an Acceptable Ride Height: when adding heavier aftermarket accessories or hauling extra cargo and gear. 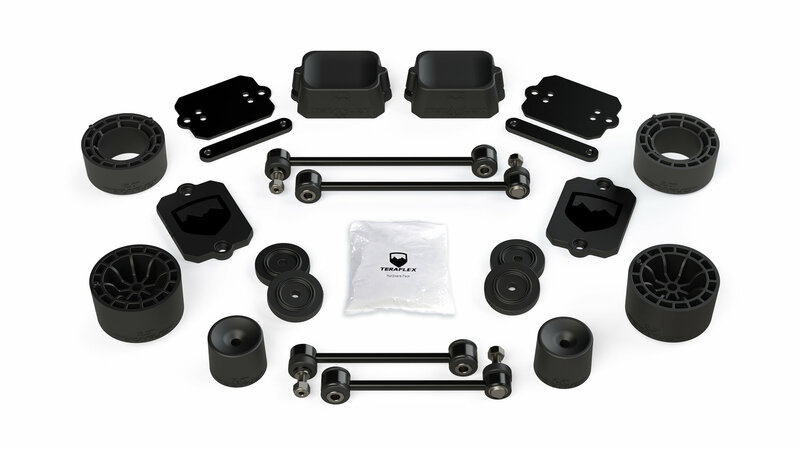 Wrangler JL Complete Lift Kit: includes 2.5” lift spring spacers, 2” front & rear bump stop extensions, 0.5” front & rear bump stop spacers, rear bump stop mounting brackets, rear bump stop straps, and front (10.75”) & rear (11.5”) sway bar links.